For the semester of spring 2014 of B.Ed, Allama Iqbal Open University has declared the annual exams date sheet. According to the schedule, these annual exams will be organized from 20th of October to 7th of November 2014. To view complete details, you can visit www.result2013.pk. This entry was posted in Date Sheet, Universities on September 30, 2014 by admin. Allama Iqbal Open University has announced the date sheet of spring 2014 annual exams for teaching programs. The exam of ATTC will be organized on 20th October 2014 while the exams of PTC and CT will be held from 20th to 29th October and 20th to 31st October 2014 respectively. To view complete schedule, you can visit www.result2013.pk. This entry was posted in Results on September 30, 2014 by admin. Federal Public Service Commission will take the CSS competitive exams 2015 from 14th February 2014. Passing in these exams will make a person to join Federal Govt. services in Bs-17 for the following groups. These exams will be organized in the following cities. The age of the male & female candidates should be between 21 and 28 years on 31st December 2014 while 2nd division bachelor degree is the eligibility to apply for these exams. Females and minorities will get 10% and 5% quota respectively. According to schedule, the online admission forms should be submitted till 1st to 31st October while hard copy of these forms along with Rs. 2200/ treasury receipt, documents and photographs must reach the FPSC headquarter Islamabad 10 days before closing date. This entry was posted in Date Sheet, News on September 30, 2014 by admin. Sargodha, BISE Sargodha Board managed FA/FSc Part 1 annual exams for year 2014 few months ago and started preparation of result of 11th class soon after the exams. Sargodha Board will prepare HSSC Part 1 annual exams result for 2014. Sargodha Board will declare 1st year result on 10 Oct 2014. Board of Intermediate and Secondary Education Sargodha will announce result of annual exams of Inter part 1 in the main auditorium of Sargodha Board. BISE Sargodha Board will upload annual exams result of Intermediate part 1 on site www.result2013.pk with complete information and for the comfort of the students. This entry was posted in Results on September 29, 2014 by admin. Sahiwal, It is reported that BISE Sahiwal Board will announce 1st year annual exams result on Oct 10, 2014 in the main hall of Sahiwal Board. Board of Intermediate and Secondary Education Sahiwal conducted the annual exams of HSSC Part 1 for the year 2014 few months earlier. When the annual exam of 1st year was finished, then Sahiwal Board started preparing the annual exams result regarding FA/FSc Part 1 for year 2014. Now the latest information regarding the annual exams result of Inter part 1 will be provided on the website www.result2013.pk and the students of 11th class can visit the site to get the latest updates of their result of intermediate part 1. Bahawalpur, BISE Bahawalpur Board managed the annual exams of FA/FSc Part 1 for the year 2014 few months earlier and started checking of HSSC Part 1 annual exams result 2014. Bahawalpur Board has decided to announce the annual exams result of Inter part 1 on 10 Oct on the orders of PBCC. The 11th class students will be waiting for the annual exams result of 1st year and they can check the Intermediate part 1 annual exams result for 2014 on the website www.result2013.pk with complete information. The students of first year will get all these information of the annual exams result conveniently. DG Khan, BISE DG Khan Board along with other educational boards of Punjab will announce result of the annual exams regarding FA/FSc Part 1 for 2014 on 10 Oct. DG Khan Board will provide the annual exams result for HSSC Part 1 for 2014 with the complete information of the 1st year result for 2014. BISE DG Khan will announce the result of the annual exams of Inter part 1 for 2014 and it will be uploaded on the site www.result2013.pk with the provision of complete information and for the convenience of the students of 11th class. BISE DG Khan has already conducted the annual exams of Intermediate part 1 for the year 2014 few months earlier. Faisalabad, BISE Faisalabad Board managed the HSSC Part 1 annual exams for the students of the colleges affiliated with Faisalabad Board during May this year. Faisalabad Board took three months in preparing the Intermediate part 1 annual exams for 2014 and announce the annual exams result of FA/FSc Part 1 for the year 2014 on 10 Oct. The candidates of BISE Faisalabad will check the annual exams result of 11th class on the website www.result2013.pk along with complete information. Faisalabad Board will announce the annual exams result for 1st year in the main auditorium of Faisalabad Board. The results have been declared on 29th September 2014 at 10:00 am by University of the Punjab for annual exams 2014 of LLB part 3. These annual exams were organized by the university some time ago. Now, after the announcement of these results, the concerned students can view their complete results at www.result2013.pk where they are updated. 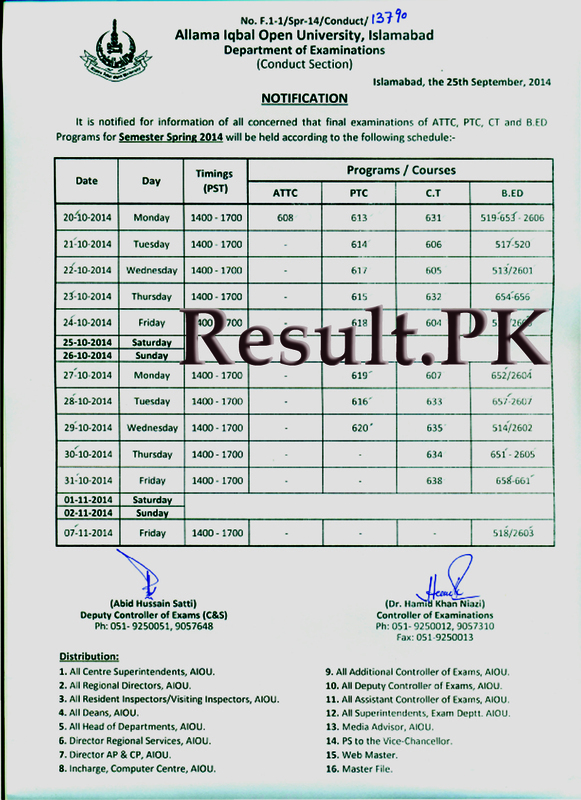 This entry was posted in Results, Universities on September 29, 2014 by admin. Karachi, Pakistan Medical and Dental Council decided to change the open merit policy in the medical and dental colleges to grant admissions to the boy and girl students. Currently, admissions are granted to the students on the open merit according to the previous policy. PMDC will conduct a meeting on 27 Sep in which this policy will be discussed. PMDC president and VC of Dow Medical University, Dr Masood Hameed said that the number of the girl students is increasing to get admission in the medical and dental colleges. He also said that most of the lady doctors do not continue their services in the medical department and they leave the department after their marriages. Every year, the number of girl students is increasing and the number of male students on the lower side, which is a growing concern for the medical department. According to the new policy, the students will be given admission in the medical and dental colleges on the open merit separately for both boys and girls. The merit will be set 50% for the boys and 50% for the girls so that boys and girls can get admission in the medical colleges equally. If PMDC accords this policy for grant of admission in the medical and dental colleges then the students will be granted admission in the medical colleges from the next year. This year, the previous policy will be considered. This entry was posted in Admissions on September 27, 2014 by admin.